Jump scares and a frantic parent shielding her child from ominous supernatural forces: These tropes are hardly new to the horror genre, but they receive a fresh spin in “Under the Shadow,” the feature-length debut of Iranian director Babak Anvari. The Tehran-set story takes place in 1988, as Iraqi bombs rain down at the height of the two countries’ war, an enticing historical backdrop for things that go bump in the night. On the face of it, the setting of “Under the Shadow” may call to mind 2014’s black-and-white Iranian vampire tale “A Girl Walks Home Alone at Night,” but the similarities stop with the nationality and demonic presence. Instead, “Under the Shadow” bears a closer similarity to “The Babadook,” released the same year, which also focused on a mother protecting her kid from an an eerie, largely unseen figure who may or may not be a metaphor for psychological duress. 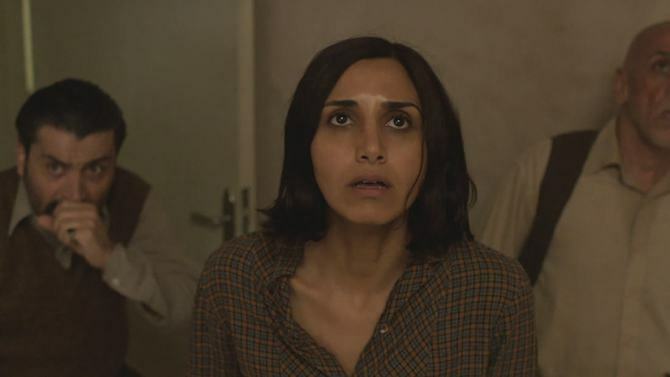 In “Under the Shadow,” the mother is Shideh (Narges Rashdi), who’s stuck in a creaky apartment with her young daughter Dorsa (Avin Manshadi) after Shideh’s husband goes off to war. With the arrival of a missile on the roof of their house, the family suddenly must cope with an eerie presence that stalks Dorsa, steals her doll and generally does a pretty good job of creeping Shideh out. Before long, she’s seeing terrifying figures and hearing ominous voices around every corner, while her neighbors flee the building one by one. As Shideh tries to keep her daughter calm, rebuffing claims of an invisible spirit haunting their home even when she’s uncertain herself, “Under the Shadow” hovers in a state of ambiguity. When Dorsa’s doll goes missing, the young girl claims her invisible friend told her that Shideh took it. This assertion could be read as some sort of burgeoning childhood resentment, but it’s infectious: Before long, Shideh’s not sure what to believe either. Her visions of sudden specters in the dead of night cull from a familiar playbook, but they’re given a fresh societal spin thanks to the complex historical setting. Initially, Shideh’s main struggle involves her attempts to return to medical school, despite the government’s disinterest in letting her do so; the claustrophobia that creeps into her existence speaks to a larger sense of restrictions that extend beyond any otherworldly threat. The floating hijab that pops up in the apartment hallway is creepy enough, but only one step removed from the moment Shideh runs scared from her home and gets admonished by the local police for not covering up. “That’s the climate right now,” one neighbor consoles her. “Don’t let that change you.” But the monster slowly advancing on her life suggests that some forces may lie beyond her control. In the confines of the apartment, Shideh attempts to lead a normal life, dancing along to Jane Fonda workout videos and listening to the BBC. Anvari threads these details into a fascinating opening act about domestic frustrations that wouldn’t seem out of place in fellow Iranian director Asgar Farhadi’s work. Shideh refuses to see her daughter’s claims of paranormal visitations as anything but bastardizations of Middle Eastern mythology. “This is not ‘A Thousand and One Nights,'” she says, perturbed at the suggestion that they might be visited by an angry djinn. But as the camera swirls around Shideh’s face as she attempts to distinguish between dreams and reality, the real horror transcends cultural boundaries. Facing the abject fear of losing a child, Shideh’s conundrum takes movie beyond its sociopolitical context to arrive at a place of visceral horror. Yet even here, the reverberations of historical trauma remain: The ubiquitous paranoia about air raids, from the daughter’s naive perspective, may as well take on ghoulish forms. Though it ultimately falls back on the usual pileup of scare tactics — floating things, gooey things, sudden forms emerging from the shadows — Anvari uses this toolbox in a pointed fashion. “Under the Shadow” smartly observes the emotions stirred up by a world defined by restrictions, and the terrifying possibility that they might be inescapable. “Under the Shadow” premiered this weekend at the Sundance Film Festival. It was recently picked up for streaming rights by Netflix.